30,000 RPM variable speed electric manicure/pedicure file designed for the professional Nail Technician. It is powerful, lightweight and comes with a cradle, On/Off foot control pedal, power station, lightweight hand piece, and these features: variable speed control, forward/reverse direction switch, easy-twist lock chuck for rapid bit change, no vibration, quiet and smooth operation, and uses standard 3/32" bits. 25 watts, 110/220 volt, user selectable. 20,000 RPM variable speed control, ergonomic and lightweight hand piece, twist locking chuck with built-in cradle holds hand piece, forward and reverse. No vibration, quiet and smooth operation, and uses standard 3/32" bits. 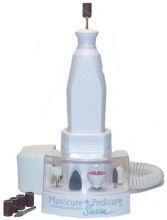 Manicure Pedicure Station, a portable and rechargeable unit, allows you to achieve professional quality results on hands, feet, and natural or artificial nails. Designed to accommodate any 3/32" carbide, diamond, mandrel or pedicure bit. Lightweight, easy to use, and comes with a charging station and bits organizer, On/Off switch, five sanding bands, and eight bits (mandrel, diamond cone, sapphire disc, sapphire cone, sapphire tapered cone, buffing cone, emery stone barrel, and circular brush). Not suitable for removing callus. 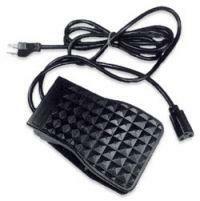 Use with 120 volt A/C adapter or two AA rechargeable batteries (both included). 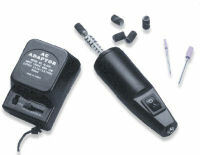 Battery operated pedicure file designed for general maintenance of your feet (reducing calluses, trimming, shaping, and buffing toenails). Great for travel when you need to keep your feet in shape at all times. No electricity required. Designed to accommodate any 3/32" carbide, diamond, mandrel or pedicure bit. Lightweight, easy to use, and comes with a travel bag, On/Off switch, and four bits (sapphire disc, sapphire cone, sapphire tapered cone, and buffing cone). Can use for manicure with the appropriate drill bits. Not suitable for removing callus. Requires two AA batteries (not included). 1 - Brass Mandrel 3/32"
Six speed settings ranging from 5,000 to 35,000 RPM with ON/OFF switch. Has a convenient Shaft Lock Button for easy installation and removal of bits without the need for an extra tool. Comes with 3mm Collect Wrench, Heavy Duty Carrying Case, and a 1/8" collet. 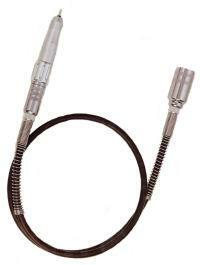 Designed to be used with Twist Lock Flexible Shaft 1/8" or 3/32" (sold separately) for best control and handling. Single speed up to 30,000 RPM with ON Forward/Reverse switch. Has a convenient Shaft Lock Button for easy installation and removal of bits without the need for an extra tool. Ball bearing design for smooth operation. Comes with collet nut and 1/8" collet. Designed to be used with Twist Lock Flexible Shaft 1/8" or 3/32" (sold separately) for best control and handling. 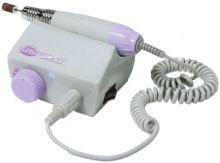 Used with Eve-&-Touch 2000, Accel Professional Rotary Tool, and Dremel 275 electric files. Provides a smaller, more comfortable, handle for controlling the electric files. Comes with a convenient Shaft Twist Lock Chuck for easy installation and removal without the need for an extra tool. Control the speed of your electric file machine with the touch of your foot. Simply plug the electric file into the Foot Control and then plug the Foot Control into a 120V electrical outlet. For variable speed controllable drill, set the speed to maximum. for best performance. 3-prong US plug.